I have to admit that I feel a little silly posting a smoothie recipe. But this one is so simple and so delicious that I feel compelled to share, because I don’t want you to miss out on this sweet, creamy, dessert-like drink. I think that, if you try this smoothie, you’ll forgive me for this slightly lazy post. At least, I hope you will! Smoothies are the darlings of the vegan world. We love to pack our smoothies with kale and spinach and chia seeds and all sorts of healthy things that most people would be horrified to see packed into a blender and pureed into a drinkable concoction. Don’t get me wrong; I love a green smoothie as much as the next girl, but lately I’ve been in a fruit smoothie groove. Normally I go all out with these, adding tons of frozen fruits and blending them into creamy oblivion. But I recently made a simple, five-ingredient smoothie so delicious that it knocked all my fancy-schmancy smoothies right out of the park and won a special place in my heart. It tastes rich and sweet and creamy and wonderful, like something you’d want to sip on a hot summer day. If summer’s done a runner on you, maybe you could just sit in front of a fireplace, close your eyes, and pretend it’s still summer. Personally, I’m loving the return of warm weather here in Madison, so I think this drink is still seasonally appropriate. Either way, you don’t want to miss out on this one! Add all ingredients to blender and puree until all ingredients are incorporated and free of lumps. Garnish with a slice of peach and enjoy! 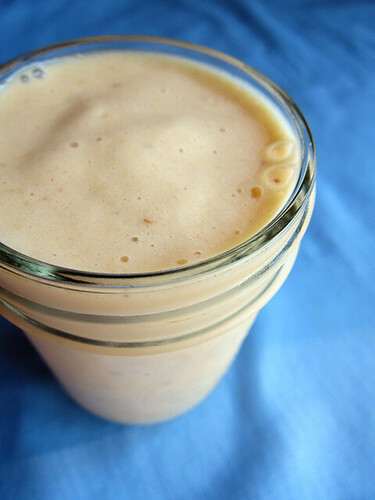 Variation: Use a frozen banana and a food processor to create Peaches & Cream Soft Serve! The secret ingredient here is soy creamer. 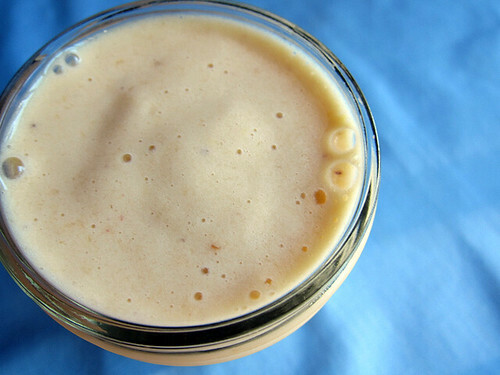 When I first made this smoothie, my freezer was a little devoid of fruit, and I despaired – I thought that my smoothie would taste overly banana-like, that the peaches would get lost in the mix, and that it would be an overall boring drink. As I rooted around in my fridge for something else to add, a carton of soy creamer caught my eye; it was on sale on the co-op recently, so I’d purchased it to have on hand. That serendipitous splash of slightly sweetened soy perfectly complemented the peach flavor and created a rich, creamy confection that I just adored. What’s your favorite smoothie blend? Do you need to remind yourself to keep things simple, or are you naturally inclined towards minimalism? Comment #34, Kim, who said “I follow blogs that have enticing photographs and delicious recipes that are easy to make. 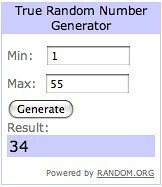 Thanks for doing such a great giveaway!” Kim, I’ll be e-mailing you soon! Thanks to everyone who entered. You all left such thoughtful and helpful comments about what makes you return to the blogs you love – I have lots to think about now! Don’t feel silly! That looks and sounds so awesome and if you hadn’t posted it my life would always be lacking in something. I bet this gives the biggest froth moustache ever!